In 2006 my wife and I did a survey of the remaining apple trees left over from the pioneer era in the San Bernardino mountains. 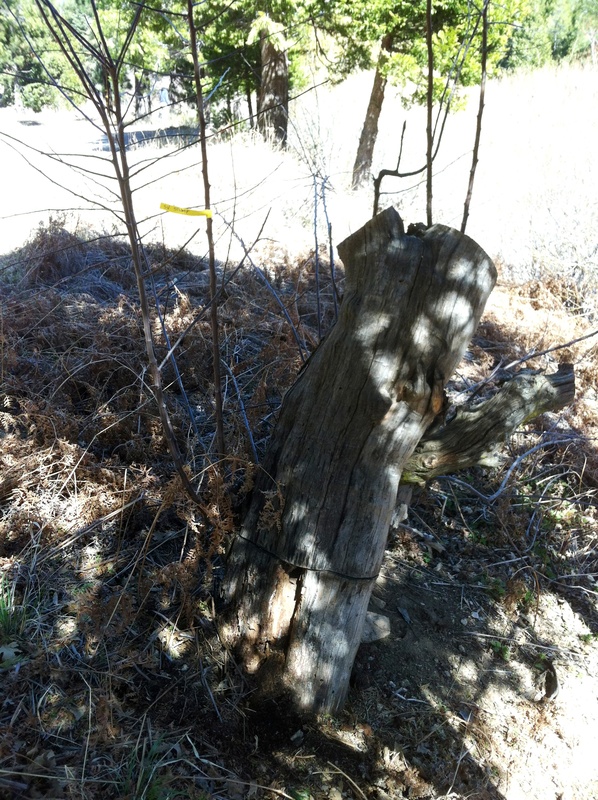 One of the key people in helping us locate them was J. Putnam Henck (“Putty”), who showed us all the old trees he knew of, including this tree and others on his family’s property behind the former Santa’s Village. 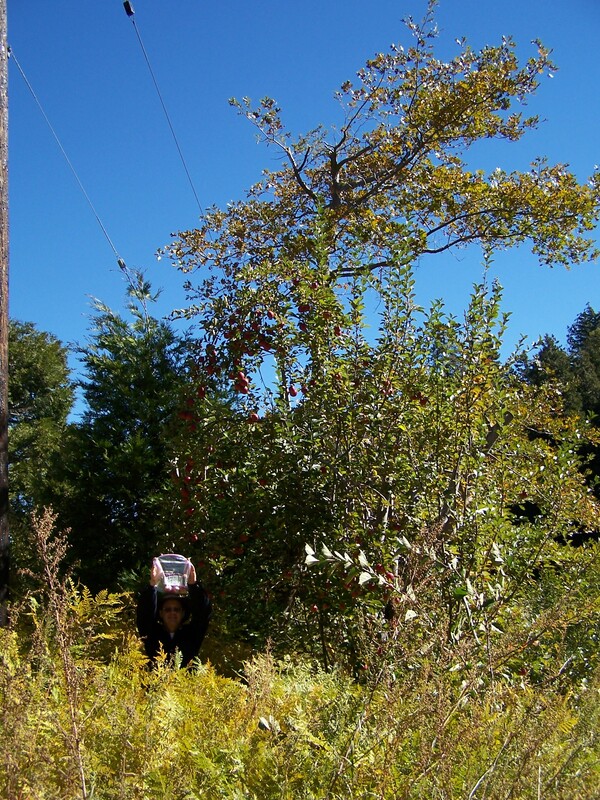 We tagged and cataloged the trees, and took samples of the apples to Oak Glen for some old timers to identify. It was subsequently cut down by the logging operations that took place on the property in the ensuing years. Fast-forward eight years, when we were contacted by Bill Johnson, asking if we could help restore the former orchard on the Santa’s Village property that was planted by the Kuffel family. I told him he hit the jackpot, we had a lot of information on those trees and the varieties that may have been grown there. He and Michelle were excited to hear this, and met with us to plan the orchard. Last weekend we were up there and found that the stump of the tree by the road had not been sawn all the way through, and a sliver of bark had allowed a sucker to grow up from the main trunk above the graft. We cut some scionwood from that sucker, and collected cuttings from the other remaining apple trees on the property. We also went over to some 100-year-old trees in Twin Peaks and got cuttings from them of the other varieties we knew were common in the mountains at the turn of the century. We grafted 100 seedlings that will be the basis for the restored apple orchard on the original Kuffel homestead behind the pond. 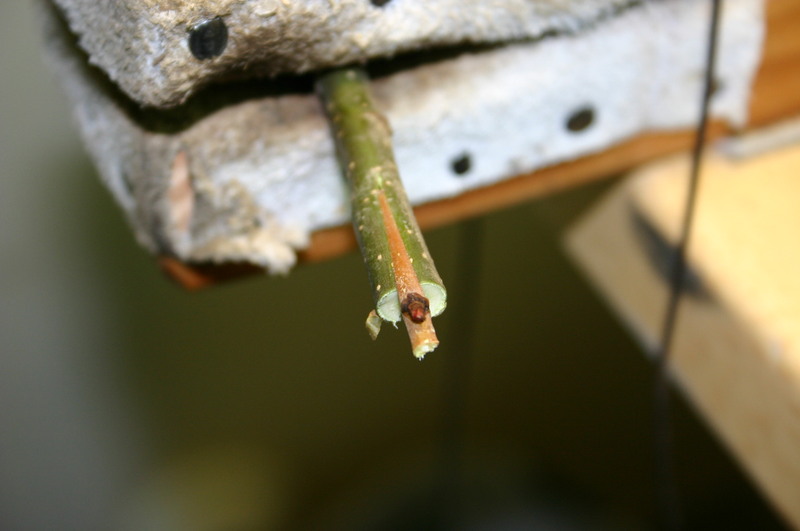 The below photo shows a bud from the scion variety grafted onto the rootstock; this single bud will form the new tree. But don’t head up there with your picking basket quite yet, the trees won’t be ready for years to start picking from. But on the other hand, we grafted them onto very vigorous rootstocks that can easily live another century, and so they’ll be there again for your grandkids and great-grandkids. The varieties are neither rare or exotic; just the old-time ones you can still get in Oak Glen, such as Rome Beauty, Winesap, White Winter Pearmain, and King David. But the taste and crunch will be identical to what Adam Kuffel and his family enjoyed over 100 years ago. This entry was posted on Friday, March 13th, 2015 at 10:32 pm and is filed under Uncategorized. You can feed this entry. You can leave a response, or trackback from your own site.